Available in Signed & Numbered (28″ x 37.5″ Edition size 95, 20″ x 26.5″ Edition size 25) and Artist Proof (28″ x 37.5″ Edition size 15, 20″ x 26.5″ Edition size 5). Artist Proof edition is personally hand embellished by the artist. 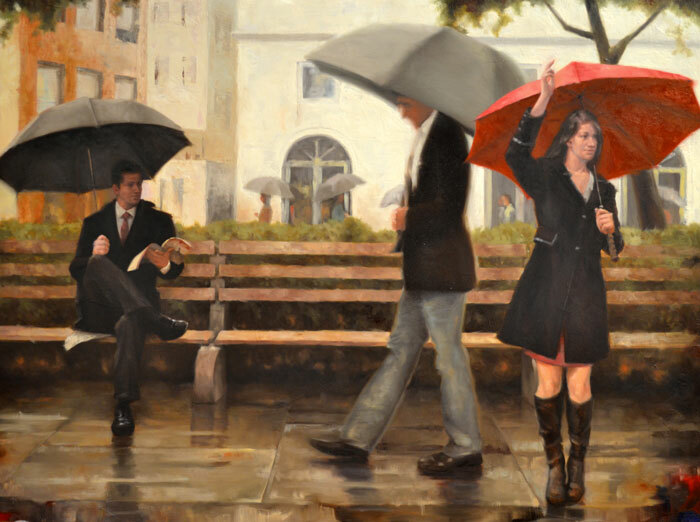 A Fleeting Moment, a giclee reproduction on canvas by Daniel DelOrfano, featuring his trademark red umbrella, highlights a young man catching a glimpse of an attractive young lady as she hails a cab.